Saturday saw Arsenal record their seventh straight win of the season thanks to a couple of late goals which sank Watford 2-0. One man who failed to shine for the Gunners though was Aaron Ramsey, who was hauled off after 63 minutes. The reception for Ramsey when he came off the pitch was mixed from fans, many of whom will likely to unimpressed by recent reports – including one in the Daily Mail – that claim the midfielder is set to run his contract down and leave on a free transfer next summer. Seemingly keen to escape England for a bit, Ramsey’s Instagram story showed him jetting off to France on Sunday morning, less that 24 hours after Arsenal’s win. His destination was Paris for the Ryder Cup. Ramsey appeared to have a great view from which to hopefully watch Europe wrap up victory over the USA. 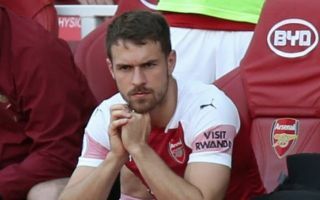 Next up for Arsenal and Ramsey, who is keen on a move to Liverpool according to The Mirror, is a Europa League clash with Qarabag on Thursday.